A letter from the Veiuto Primary School in Suva telling parents they will deal with students caught playing the Charlie Charlie game. Schools across the country have taken action to stamp out the demonic game, Charlie Charlie, from their compounds. Many have issued letters to parents, urging them about the need to talk to their children on the negative impact of students playing Charlie Charlie. Veiuto Primary School in Suva, in a letter to parents, said they would deal with students who were caught playing the demonic game. Labasa’s Nasekula District School’s head teacher Jagdish Prasad said the teachers at the school had monitored the 116 students very closely. “The issue was addressed during the assembly to students and it was again stressed to teachers to monitor the students very closely,’ he said. Acting Permanent Secretary for Education, Heritage and Arts, Kelera Taloga, has told all schools to prohibit the game in the school premises. Nasekula District School headteacher Jagdish Prasad said the teachers were monitoring their 116 students closely. The headteacher of Nasavusavu Primary School in Savusavu, Isoa Qeleni, said most of his students had no idea about the game. During the school assembly, he stressed to the 350 students not to think about researching the game. The headteacher Naselesele Primary School in Taveuni, Onisimo Ratu, also said its 130 plus students were also unaware about the game. “I have also informed teachers to keep a close eye on students and prevent the students from attempting to try playing the game,” Mr Ratu said. 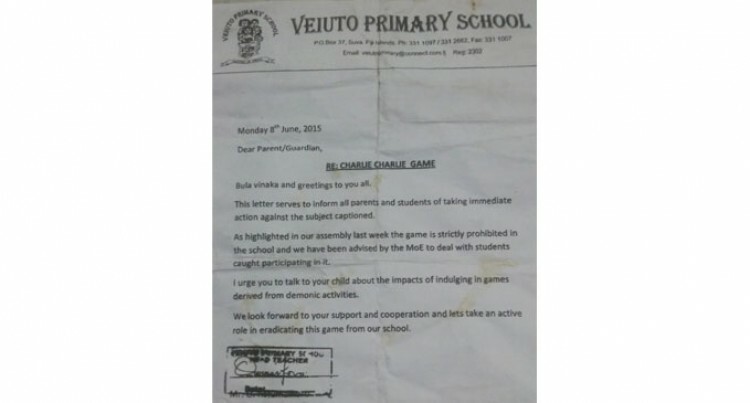 Mrs Taloga said the ‘Charlie Charlie’ game was disrupting the process of teaching and learning in schools. “The game is associated with cult activities and we strongly recommend that all schools and relevant stakeholders take an active role in preventing our children from engaging in this game,” Mrs Taloga said. The ministry also warns that those who breach the directive will be disciplined. Meanwhile, a student of Marist Brothers High School (MBHS) who posted a video of them (Marist students) playing this demonic game ‘Charlie Charlie’ has gone viral on social media. MBHS Manager,Rupeni Tamani, said the school was also aware of it. “The video was posted up three weeks ago and students were warned and told to take down the video but it was too late since the video had gone viral on social media,” Mr Tamani said. “Parents of students who are involved in this video will be called and the school heads will be discussing this issue with them,” he said. Mr Tamani said that the Ministry of Education had also issued a stern warning against students playing the demonic game. The “Charlie Charlie Challenge”, as it is being called, entails placing two pencils on a piece of paper in the shape of the cross with the words ‘yes’ and ‘no’ written in each quadrant.